A Problem or a Predicament? Two-and-a-half months. 76 days. Over 1,800 hours. 6 million endless seconds. Wet. Cold. Hungry. Thirsty. Adrift in the Atlantic Ocean – alone. Steven Callahan left Rhode Island on his sloop, the Napoleon Solo, a 21 footer that he designed and built himself. He set sail solo, bound for Bermuda. From there, he sailed to England. Leaving England, he set sail for Antigua. Seven days into the voyage, in the middle of a night hurricane, something hit his boat and put a hole in the hull. The Napoleon Solo began taking on water and was soon swamped. Callahan escaped to an inflatable raft. He had a small provision of food and water, a sleeping bag, a few flares, navigation charts, and a small device to distill drinking water from the sea. Ocean swells soon separated him from the Solo. He was adrift in the middle of the Atlantic, at night, in a hurricane – alone. He survived the night. The next morning found him drifting with the current and trade winds. His small stores of food and water were soon exhausted. He made a spear for fishing and devised an elaborate system to capture rainwater for drinking. He existed on about a pint of water per day – the size of two school-sized milk cartons. Steve dealt with a leaking raft, sharks, and equipment which did not function properly. He lost over one-third of his body weight and suffered saltwater sores over his entire body from being constantly soaked with cold seawater. He dealt with physical deterioration as well as extreme stress brought on by the situation. Callahan spotted nine ships, but none of them saw his flares. Facing discouragement bordering on despair, he realized that he had to rely on himself to survive. He began a daily routine designed to save his life. He navigated as best he could, given the currents and the lack of sails or rudder on the raft. He fished and harvested water. He exercised. He devised ways to measure his progress. He worked and watched. For 76 days – over two months, Callahan remained adrift, captive of sea, wind and current. After drifting 1,800 nautical miles, he saw lights. 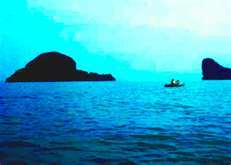 He was near the coast of the small island of Marie Galante, near Guadeloupe. He was rescued the next morning by a fishing vessel. Steven Callahan called his voyage “a view of heaven from a seat in hell.” He found strength within himself, a will to survive and thrive. His exile uncovered gifts and unlocked a profound positive mindset. Notice that he did not ask “If”. He asked “How”. The choice between the two makes all the difference. Steven Callahan could not control what happened to the Napoleon Solo. He could not control the wind or the rain or the direction of his drift. But he could control his mindset. He could control his attitude and his approach to the problems he experienced. He salvaged success and rescued himself through ingenuity, courage and a will that refused to give up. John Maxwell, in his great book The Difference Maker, distinguishes between problems and predicaments. Predicaments are things that we cannot control. Problems are things that we can control. Steven Callahan’s predicament was that he was a castaway, adrift on the Atlantic Ocean in a small life raft, a floating speck that could not be seen in the vast expanse of the sea. His problem was that he didn’t have supplies. He couldn’t control the fact that his sloop sank. But he could control his problem of food and water. He made a spear and caught fish to eat. He fashioned a way to capture rainwater. He controlled his mindset and attitude. He exercised and monitored progress. He became a problem solver. How about you? What predicament are your dealing with? Are you wasting energy trying to control the things you can’t control? Shift that focus away from the predicament, and apply it to solving the problem. As we solve the problem, the things within our control, we are better able to manage through the predicament. Callahan went a step further. He used the predicament and its problems to create a solution to benefit others. His ordeal led him to develop a new kind of life raft called “The Clam”. It is a utility craft that eliminates many limitations of traditional rafts to help sailors better survive. It has a canopy to shield the sailor from the sun, a fiberglass hull to help prevent punctures, and most importantly – a sail. 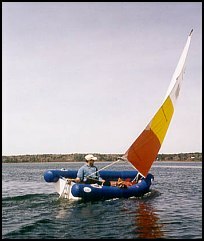 The sail allows the castaway to navigate, rather than be at the mercy of winds, tides and currents. Often I am asked the question, “Why? Why did this happen?” But the real question for our growth is not “why”. The real question is “what” – what can we learn from the experience, and how can it benefit others? Steven Callahan experienced 76 unimaginable days. His predicament and its problems changed his life, and the lives of others. But he refused to give up. Instead, he became a problem solver. How about you? How will you solve your problems? How will your experience benefit others? This entry was posted on Friday, February 10th, 2012 at 1:49 pm	and posted in Uncategorized. You can follow any responses to this entry through the RSS 2.0 feed.